As the events industry continues to compete in challenging economic conditions, our session on leveraging technology to create new revenue opportunities created a lot of interest during Confex last month. Over 50 people attended, hoping to understand how they can maximise the use of what, in most cases, they already have. 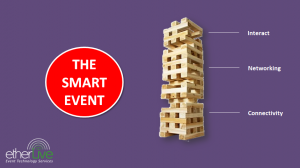 We started the session discussing the event ‘Jenga’ tower – this simple approach helps organisers understand the importance of the foundation and building blocks before adding revenue related solutions. Without the stable foundation blocks of connectivity and networking in place – just like Jenga – the tower is likely to fall when you add more weight (or in this case products) to the top. We presented that the best ways to get a stable foundation include asking the right questions of a venue (see our 10 critical questions here), talking with experts on the actual requirements and placing orders early (often saving money). Maximising content – If your event involves presentations or discussions, stream the content for free over services such as ustream or for internal events check if the organisation has a method to allow sharing of video. Publishing the content for free can be done with advertising subsidy but if you want to charge that’s also possible. Either method will allow those who can’t travel to join in. Increasing exposure for sponsors – In addition to the normal sponsor opportunities technology can add more exposure and record those who use it. For example offering a free Wi-Fi hotspot to attendees for their email and a few other key bits of information (like post code) allows the collection of data for providing a service. A hotspot in one specific area will limit the investment needed. Cashless/Contactless technology – Contactless systems allows payments to be processed quicker. This could be a ‘closed loop’ system like a token or loyalty system which enables the event to offer reduced rates and therefore collect data on what’s being consumed. ‘Open loop’ systems such as those with Visa or MasterCard enable reduced transaction times and drive up spend. Exposure to social media systems – Allow attendees to check in to locations or use QR codes to download content immediately. Linking with social systems enables free exposure to the attendee’s networks such as Facebook, Twitter or LinkedIn enabling your event to be exposed to people who may work in similar industries or have similar interests. Smart applications – Apps continue to be expected for many events, allowing access to speaker’s biographies, voting functions, live Q&A and pretty much anything that can be imagined. The audience at Confex asked good questions, for example; how much are things like splash pages worth to sponsors? Which of course depends on the exposure and type of audience. There was also interest in what information is available to help with new technology topics. A great resource is the ESSA technical guide available to all members.